Since its foundation in December 1987 Hamas, a religious/political Islamist movement, has as its declared ideological goal, according to its covenant, "to raise the banner of Allah over every inch of Palestine" and its strategic "solution for the Palestinian question is [only] through Jihad [holy war]." During the years 1994-96, Hamas' preferred "jihad weapon" has been suicide bombings against Israeli citizens, which derailed the Oslo peace process between Israel and the Palestine Liberation Organization (PLO). During the bloody years of the second intifadah (2000 – 2005), Hamas was responsible, together with the Palestinian Islamic Jihad, for some 70% of the 150 suicide bombings which killed more than 1000 Israeli citizens. Following Yasser Arafat’s death in November 2004 and the election of Mahmoud Abbas (Abu Mazen) as Chairman of the Palestinian Authority (PA) in January 2005, Israel embarked in the summer of 2005 on a process of disengagement from the Gaza Strip and withdrew all its settlers and soldiers. Hamas presented the Israeli disengagement as an affirmation that its strategies for resistance led the Palestinian people to victory. This led it to participate at the January 2006 Palestinian elections, which it won because of the deep divisions in the Fatah movement, the main political force in the PA.
Hamas’ electoral victory was followed by a decision of The Quartet on the Middle East (a foursome of nations and international entities involved in mediating the peace process in the Israeli-Palestinian conflict) conditioning the recognition by the international community of a Hamas government by it meeting three requirements: recognition of Israel, acceptance of previous agreements signed by the PLO, and renunciation of violence. Hamas was quick to reject all three. The conflict between the PA presidency, supported by the Fatah constituency, and the Hamas government, escalated the intra-Palestinian violence and Hamas finally took over Gaza in June 2007 by a bloody military coup in which some 200 Fatah militants were assassinated. Hamas forces continued now to expand quickly inside Gaza, got more sophisticated weapons, especially longer range rockets through smuggling tunnels bellow the Egyptian border, and formed a 20,000 military force trained with support from Iran, Hizballah and Syria. Rocket fire and mortar shelling from the Gaza Strip first started in 2001, gradually becoming the major threat posed by the Palestinian terrorist organizations, a simple and cheap solution, which disrupt the lives of Israeli civilians, destabilize their social fabric, override the security fence and create a kind of balance of terror. Since 2001, 3984 rockets and 3,943 mortar shells have been launched at Israel. In 2008, Hamas put into use 122-mm Grad launchers and 120-mm mortars smuggled from Iran, significantly increasing their range of fire (from 20 to 40 km) and effectiveness. They gradually put nearly one million Israeli civilians living in the south (about 15% of the entire population) within the range of the rockets, and posed a security challenge to Israel. After Hamas unilaterally ended on December 19, 2008 a six months lull arrangement (tahadiya), and fired at least 60 rockets and mortar shells at the cities of Ashqelon, Netivot and Sderot, and at the populated areas close to the Gaza Strip, Israel launched Operation Cast Lead on December 27. During the air campaign against the Hamas infrastructure and the first phase of the IDF ground operation some 400 hundred Hamas members were killed. Unfortunately, probably some 300 hundred civilians were also killed. The great number of civilians killed is the result of a deliberate strategy of use of human shields in its operational terrorist and guerrilla activities. Hamas has shown no sensitivity to the suffering of the Gazans, has put its own people in a hostage situation and has cynically used the misfortune of its civilians to score points in the propaganda war against Israel. As some Gazans openly put it: Hamas built underground bunkers for its leaders and instead of building shelters for the population it has hidden behind its civilians. Israel has two main strategic goals in this operation: stop the shelling of citizens in southern Israel, and prevent Hamas' increased military strength through the continued smuggling of weapons. In the longer run this could significantly diminish its political clout and shatter the organization's exclusive control of the Gaza Strip. It is imperative for Israel to win decisively the present war against Hamas not only for the security of its people, but for major regional stakes. It should be crystal clear to every reasonable people in Israel, the Palestinian Authority and the international community that the Hamas control of Gaza will thwart any peace agreement between Israel and the Palestinians and threaten the rule of the moderates in the West Bank. Finally, a lack of clear victory on Hamas would utterly change the balance of power between the moderate Arab states in favor of the radical coalition Iran-Syria-Hizballah-Hamas, thus farther destabilizing the Middle East and enhancing Iran's hegemonic status in the region as a potential nuclear power. 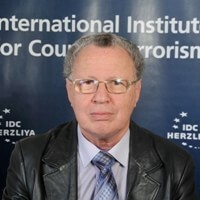 Dr. Ely Karmon is Senior Researcher at The International Institute for Counter-Terrorism (ICT) at The Interdisciplinary Center (IDC) in Herzliya, Israel.